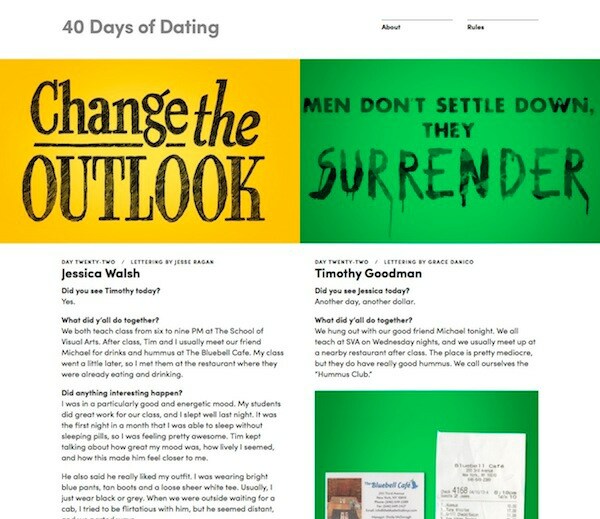 Jessica Walsh & Timothy Goodman asked me to contribute lettering of the words “Change the Outlook” for day 22 of their much-discussed romance-adventure saga, 40 Days of Dating. I drew the final lettering by hand, since an open brief gave me the opportunity to take a breather from vector drafting. The phrase seemed reminiscent of mid-40s ad copy, so I took inspiration from some period lettering: the titles from the trailer for the 1945 film, Week-End at the Waldorf.